Bharateeya culture has given special importance to every season and month of the year, according to the atmosphere during particular time period of the year. Puranas have suggested Vratas to observe for the inner purification, spiritual upliftment, good health and a peaceful life. The Vratas are in various forms, types, and with different intensity, easy to difficult, so that everybody can walk on the path of Yogashastra with ease to reach the JeevanMukti. Chaturmas are the four sacred months that fall in the rainy season according to the Indian climate. These are Aashadh, Shravan, Bhadrapad, Kartik. Chaturmas begins with Ashadh Shukla Ekadashi (which is today) and ends with Kartik Shukla Ekadashi. 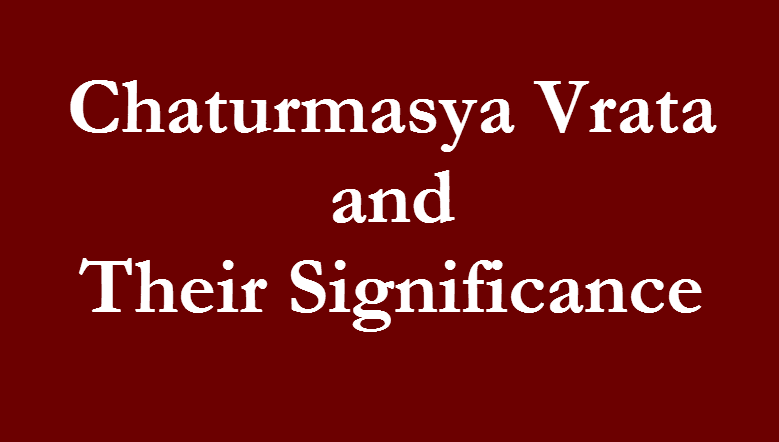 The Vratas followed during Chaturmas are called as Chaturmasya Vrata. Vratas teach us a controlled life which help us control emotions. We grow with emotional and physical health. Vratas are not just for women, everybody who wants to live a more peaceful life can observe them. I read more about Chaturmasya Vrata in PadmaPurana and decided to share the Vrata which can be practiced in today’s fast life. Fast : Fast can be observed depending on the physical health of the Vrati - the person who is following the Vrata. One can take the meal just once, or decide to eat only specific foods or not eating particular foods. In the current fast pace of life it’s difficult to maintain the health, the work life balance following hard fast Vrata. So, one should try not to take any extremely difficult Vrata which may harm their health. Also, if you decide to observe Fast do take doctor’s advice before starting it. Main purpose of fast is some control on eating habits (which is now known as dieting :) )and to recite the Name of Bhagwan and spend time in Bhajan - Keertan or Yogabhyas. So, if fasting completely do not serve these purposes, they shouldn’t be observed. Mostly women work staying hungry and damage the health for various Vratas, which is not good for health. Working women have to take the extra load of household work and professional duties, so any Vrata at the extreme intensity shouldn’t be observed. Maun / Silence : This Vrata is not just useful for spiritual goals but it improves our efficiency too. Staying silent saves lots of energy and improves concentration at work. Staying silent doesn’t mean you shouldn’t speak a single word. Complete silence may hurt you. But we can make habit to speak less, to speak what is important, truth and needed to speak. Maun can be observed in morning before starting the routine, when we spend time in Dhyana, Sadhana or Puja, also before going to bed. One can decide a few hours of Maun daily for these four months. If you try these I am sure you will not be ready to break this habit again. Don’t force yourself for anything hard but the time which you can spend peacefully - silently. For better practice, tell everybody in the family that you have decided to stay silent during this particular time, so that nobody will disturb you. The biggest benefit of Maun is that you get the time to know yourself, to know your hidden qualities which are just ignored by you because you were too busy and engaged in the unnecessary activities. Maun gives you time for discovering more creative ideas. Being more focused means more work done and less stress. For the beginning you can start even with only 10 to 20 minutes of Maun. In today’s era of whatsapp, Facebook, Instagram, one can spend time in living the beautiful moments of life, spending less time on social media can also be termed as Maun. Maun during Meals: According to Padmapurana, eating silently is equivalent to observing Fast. Due to addiction of TV and serials many people take dinner in front of TV, children love to eat while watching cartoons. But this habit doesn’t let us enjoy the food. The negative, sad news of news, or negativity in serials affect our mind and we can’t enjoy the taste of the food. Samartha Ramdas Swami has said that meals is like Yagya - As Jatharagni is produced when we are hungry, when we eat we do Yagya, so it should be done divinely. Silence during eating may help in a calm mind and better emotional health, and help in digesting the food as mind is formed by what we eat. Silence doesn’t mean just shutting the mouth, the important thing is that enjoying the food and stay calm at least an hour without multitasking like checking mails, facebook, uploading photos of your food. Japa / Recitation: Reciting the name of Bhagwan or reciting hymns daily can be another Vrata. Needless to say that Hymns which praise the Lord brings instant peace in the mind and makes the devotee happy. A heart filled with the devotion of Bhagwanji, is the heart with humanity and kindness. Danam: When we stop eating particular grain or food or fast for four months at the end of the Vrata we are supposed to donate the same to somebody. Just imagine how beautiful this system is! When we stop eating something as part of Vrata, we save it for four months and then are supposed to give to the needy. This is written in almost every Purana, for Udyapan of almost every Vrata. They have tried to maintain the social economic balance. Puranas are written when there wasn't any socialism or communism. In current economy of globalisation despite high growth rate, in many countries the gap between poor and the rich is increasing. This is happening because we are forming the systems without the base of Dharma. Vrata and Dana can be done by everybody at the level they can do. So everybody can donate little or more to maintain the economic balance. Controlling Anger: We know how much anger is harmful for the health. It also hurt relationships. For the Chaturmas one can take the pledge to control the Krodh - Anger. Dhyana: PadmaPurana says by Dhyana you will achieve the Brahmapada. Being Yogi is the highest achievement of the human life.